Traditionally, the nervous and immune systems have been regarded to function largely independently of each other. 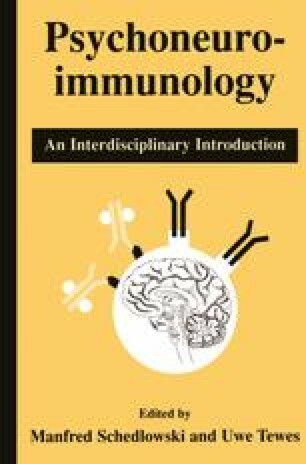 Interdisciplinary investigations of the recent past, however, have demonstrated that the nervous and immune systems have close functional interrelationships at several nodal intersections (Ader & Cohen, 1993; Besedovsky & del Rey, 1996b; Felten & Felten, 1994; Ottaway & Husband, 1994; Weihe, Nohr, Michel, Müller, Zentel, Fink, & Krekel, 1991a). Transmitters of the nervous system act on immune cells and messengers of the immune system influence the nervous system. Typical neuronal messengers appear to be synthesized in immune cells, and typical immune cell messengers appear to be produced in neurons. This is a further dimension of complex neuroimmune interactions. Functional interactions between the nervous and immune systems are fundamentally important not only for physiological regulations, but also for diverse diseases such as chronic painful inflammations (arthritis, pancreatitis), degenerative diseases, autoimmune diseases (Multiple sclerosis), and viral infections affecting the nervous system (e.g., neuro-AIDS)(Akaine, Weihe, Schäfer, Fu, Zheng, Vogel, Schmidt, Koprowski, & Dietzschold, 1995; Anisman, Baines, Berczi, Bernstein, Blennerhassett, Gorczynski, Greenberg, Kisil, Mathison, Nagy, Nance, Perdue, Pomerantz, Sabbadini, Stanisz, & Warrington, 1996a,b; Eiden, Rausch, Da Cunha, Murray, Heyes, Sharer, Nohr, & Weihe, 1993; McGeer, Rogers, & McGeer, 1994; Nottet & Gendelman, 1995; Weihe, Nohr, Müller, Büchler, Friess, & Zentel, 1991b; Wekerle, 1993). The following presentation provides fundamental insights into the complex functional and molecular anatomy of the dialogue between the nervous and immune systems in health and disease, and outlines perspectives for novel therapeutic strategies targeted to restore the disturbed neuroimmune interactions.